I was at a backyard party in Brooklyn a few weeks ago hosted by my friend June. I’d been to her paella party at about this time of year last summer, and so I knew what kind of yumminess to expect from this event. I got there a little late, again. 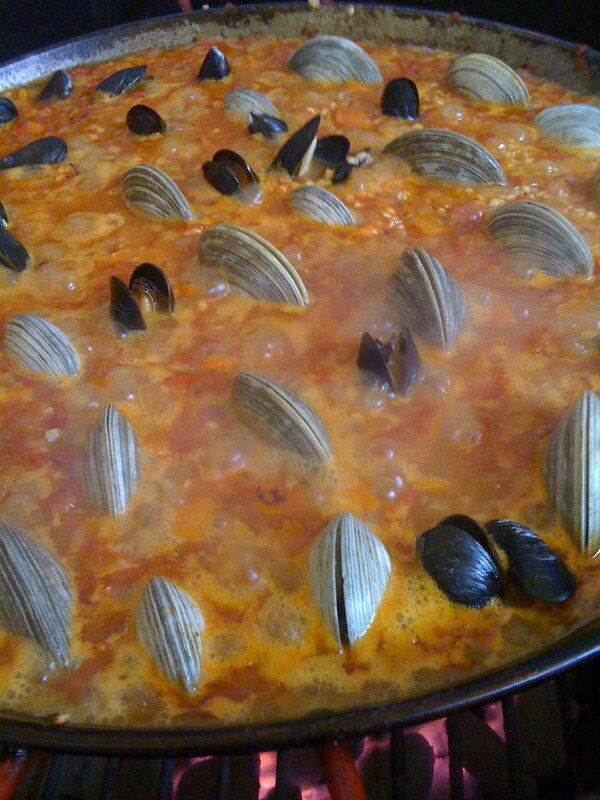 June was just adding the shellfish to a paella pan, plunking clams and mussels hinge side down into the rice. The wide, cast-iron pan was placed on top of a blazing hibachi grill on a small space of concrete. On top of another grill, there were sliced zucchini just going down, the smell of blackened shisito peppers was in the air, and trays full of grilled sausages, browned chicken, rabbit meat and beans flocking the station all told me that June had been laboring over open fire for some time now. My cocktail, served up by a guest/friend behind a makeshift bar, must have gone straight to my sun-weary head. I stood before the barbecue, transfixed, and watched the mussels and clams slowly open in the pan and continue to gape wide, as if they were all preparing to sing the Hallelujah chorus. Since then, I can’t get paella off the brain, so I had to bug June for her tips and pry her tried-and-true recipe (below!). The detailed procedure she provides in it was eye-opening to me in many ways, and I can’t wait to give it a try. Good ingredients are key: June sagely froze peas from this spring to sprinkle on at the end, while her lima beans were just in-season and fresh. (Beans are a traditional addition often forgotten today, from the dish’s peasant roots.) June is actually a very talented cook of all kinds of food, not just paella. 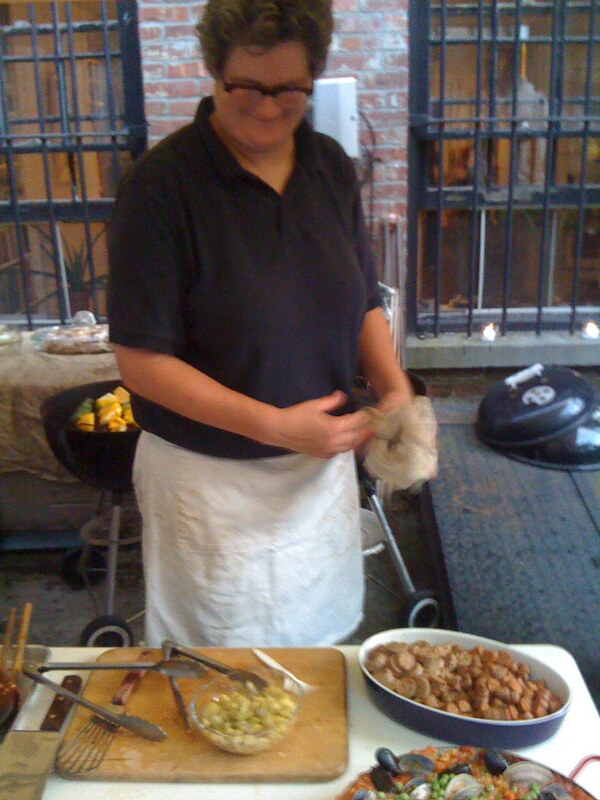 And when not cooking, entertaining or putting up foods for the winter, she is advocating for and visiting regional farms as the farm inspector at GrowNYC. GrowNYC is the non-profit that makes the Greenmarkets happen, and they recently changed its name to that from CENYC, the acronym for Council for the Environment of New York City. And are they ever growing — there are more Greenmarkets, more farms selling at them and more variety amongst them than ever. Have you noticed it this summer, too? As mentioned, the expert’s recipe is below, and I hope you’ll try making it outdoors before the summer’s done. Here are a few more questions I put to Inspector June, in case you had burning questions about the dish, too. So, you must be Spanish, a true Valencian, correct? JR: Laughter! A lot of people think that. Must be my mid-western accent, it’s often mistaken for Valencian. 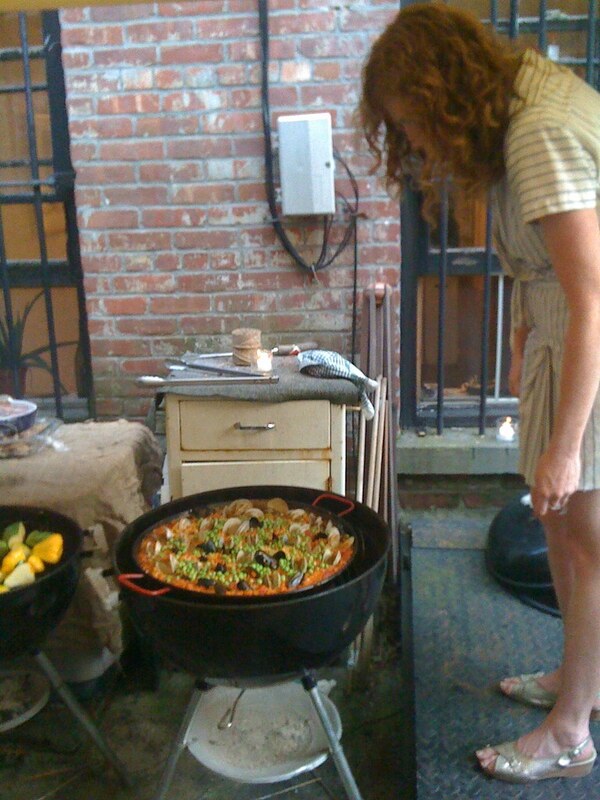 What made you decide to bring paella to Brooklyn? JR: About six years ago, this woman hired me to cook for her husband’s 50th birthday. He was a volunteer fire fighter, and had just built a fire pit he was really proud of and wanted to use for his party. So I did paella for him and bought a large paella pan to do the job. I had also just moved to Brooklyn with my girlfriend, into a garden apartment with space to grill and entertain. I did my first party with friends that same summer. Everybody brought an ingredient, it was a blast. JR: I worked in the kitchen at Zingerman’s in the 90’s, and made vegetarian paella almost every day during Spanish Food month. They would, and still do, an authentic paella out on the patio, so I watched and learned. I have learned a few other tricks over the years though, like making the sofrito ahead of time to really build some flavor from the base, and saving broth and drippings from the sausages and meats I prepare ahead of time. Does it really need to be cooked outdoors over an open flame? JR: No, you can cook a paella stovetop as long as your pan fits the burner, but it is traditionally an outdoor production. I have two different sized pans now, and the large one fits perfectly on my grill. I can get a more even heat on the grill then I could from a burner, and the rice cooks better that way. La Tienda has paella burners that use propane but I haven’t bought one yet. Paella is a great high summer dish to make, when everything is bountiful at the market and you just want to be cooking outside. 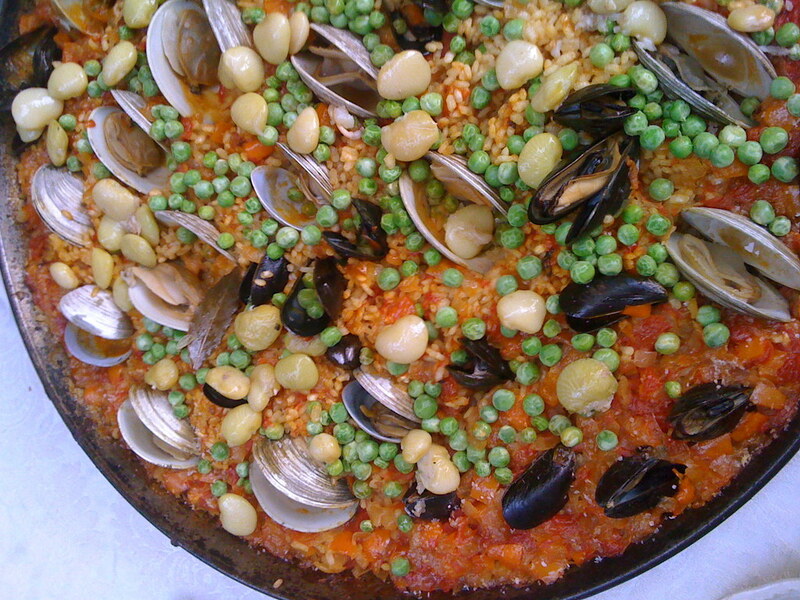 What makes paella a great dish to serve up at a party? JR: People don’t get to see paella being made very often, so it is fun to see people’s reactions to watching it all come together, especially when the shellfish start to open. There’s lots of oohs and ahhs. It’s also a great way to feed a lot of people. I was in France a few years ago during the Tour de France, and these guys were making a ginormous paella to feed the crowd that was there to cheer on the riders. It seemed like their version of street fair food. What’s the best part about paella, in your opinion? JR: As a cook, you can’t help but get obsessed with the crust or the socarrat. When you get the heat and the timing right, the rice forms a crust on the bottom that adds a great texture to the dish that is coveted by paella lovers. When I worked with Dominican and Puerto Rican kids on the Lower East Side we made arroz con gandules and they would always let the rice burn a little and make a crust. The kids said that the elders always love the “con-con.” I love that image, and think a lot about what that means. And I’m just smitten with how beautiful it is when it’s all done. What is your official title at GrowNYC? JR: My coworker warned against titles which contain an “and” but I manage Farm Inspections AND strategic development and regulations. My role has expanded in the last year, and has not settled into a tidy moniker yet. JR: I have been with Greenmarket for over six years. I started by managing neighborhood markets and doing cooking demos at Union Square. I LOVE neighborhood markets, People don’t realize how great they are, or what an incredible network we have. People fixate on Union Square, which is great, but there is a lot more. So does being an inspector mean you’re like a cop? JR: I am really (don’t tell anyone) primarily an advocate. I spend a lot of time at markets and on farms, mostly learning the issues, ebbs, flows, and products that our farmers and region produces. Sometimes you come across someone who is pushing the line and we address that when it happens. But because I spend so much time out in the region, I have become a pretty good scout, looking for ways to tie Greenmarket into a larger, viable food system. That work has become really exciting for us, and has lead to projects such as facilitating the renewal of grain production in the Northeast, and we are now working to connect farmers with processors and processing initiatives in the city. So maybe some short-grain rice for paella can be found at the Greenmarket soon? Check back in a few weeks to see, and in the meantime, here’s that recipe! *Barnyard stock (stock made from all the bones saved in the freezer until there is enough to make stock with) and water. I use a 1:1 ratio of stock to water, plus all the drippings (see below) so there is lots of flavor, but it’s not too rich. I do the sofrito the day before so that it cooks down slow and gentle. Dice the onions and peppers to a quarter inch and sweat on a low heat until soft and sweet. (Add the garlic after the onions and peppers have been cooking down for about 10 minutes.) This can take a while, like 45 minutes or more. Add tomatoes and simmer on low until the mixture gets thick. Let cool and refrigerate. And the rabbit; break the rabbit down into pieces, salt, brown in a skillet and finish in a hot oven. Save all the juice and drippings from everything to add to the liquid*. Clean shellfish: wash the clams well, and de-beard the mussels. Prep the mis en place; get everything you need ready to go at your grill station. Light a charcoal fire, with enough briquettes to make a double layer of coals around the grill bed. I use charcoal briquettes because they generate a lot of strong, even heat and last a long time. Tip: While the grill is hot, I use a comale to cook off shisitso peppers, and some haloumi cheese for starters. When the coals burn down to an even medium-high heat, place the paella pan on the grill, and let it heat up. Add the sofrito and let it get hot, stirring constantly. Add the paella rice and saffron and stir the rice into the sofrito, like a pilaf, letting all of the rice kernels get coated with the sofrito and turn slightly translucent. Add the combined liquid, paprika and bay leaves. Stir well, getting the rice evenly distributed around the pan. Add the meats, placing evenly around the pan. Leave it alone. When half of the liquid has cooked into the rice, place the shellfish, hinge side down, into the paella, evenly distributed around the pan. Add the lima beans. When there is just a little liquid left, and the shellfish have opened, add the peas. Let it cook until it appears all the liquid has cooked into the rice. Remove from the heat and let it finish cooking for another 5-7 minutes. Your paella recipe sounds great. To take make it just one step easier try using this really authentic tasting sofrito (sautéed seasoning) from http://www.OldHavanaFoods.com we found on the web. It works really well in Arroz con Pollo (chicken and rice), Picadillo (Cuban sloppy joe’s), chili, beef short ribs braised with wine and many other dishes. Given the size of this recipe it probably would take 2 big jars (24 oz ea) of their sofrito but it would save one day’s work! Wow, that paella looks awesome. Thanks for including June Russell, it is fascinating to learn more about the behind the scenes of the greenmarkets. Whoa! 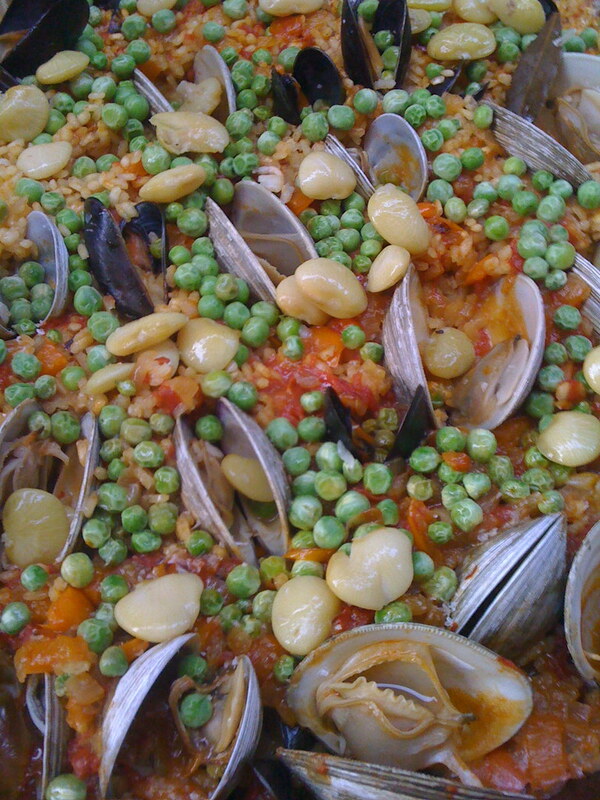 I would *love* to have a good vegetarian paella recipe! Would June share that as well?! I’ve gotten paella at least twice this month at food festivals and I’ve been looking a recipe to use, I think this one might be it. Is there an acceptable substitute for Merguez sausage if my butcher doesn’t have any? Should I just use any lamb sausage I can find? Jessie: for a vegetarian paella I would build more flavor into the sofrito, maybe add some poblano peppers. I don’t like canned veg stock, but if you blanched some carrots, and green + yellow beans you could use that liquid. I would probably grill some onions or shallots to throw in too, otherwise cooking the rice is the same. Adam: Traditionally you would use chorizo, either fresh or cured. You want something that has paprika and or ground chili’s in it, you could also use hot italian sausages. Those should be easy to find. Oh my that sounds delicious. 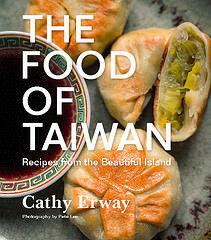 I only look at the pictures and try the recipes! This is such a beautiful post. Thank you for making it. Is there no oil used in this recipe? Even in the sofrito?